We strive for 100% Customer Satisfaction and we love to hear from you. If you are unsatisfied with your order for any reason, Please Contact Us and allow us the opportunity to resolve your issue prior to posting a Negative / Neutral feedback or filing any disputes. We are sure the problem can be resolved! Your positive feedbacks and DSRs are extremely important to us as better DSR scores affect our search visibility and fees on eBay. We try our best to earn good feedbacks and 5-star DSR ratings from you. Please note that 4-star (or below) is considered a bad rating for sellers and can result in restrictions on our account. Please help us maintain our business. 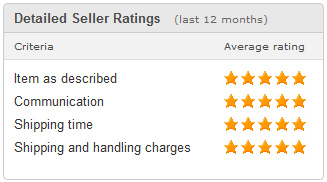 Support us by rating 5-Star DSR Ratings in all 4 categories. If we have not given you a reason enough for 5-star ratings on each DSR then please contact us to let us know how we can earn your 5-star rating before submitting your scores!